April 4, 2019, 51 years after his assassination. 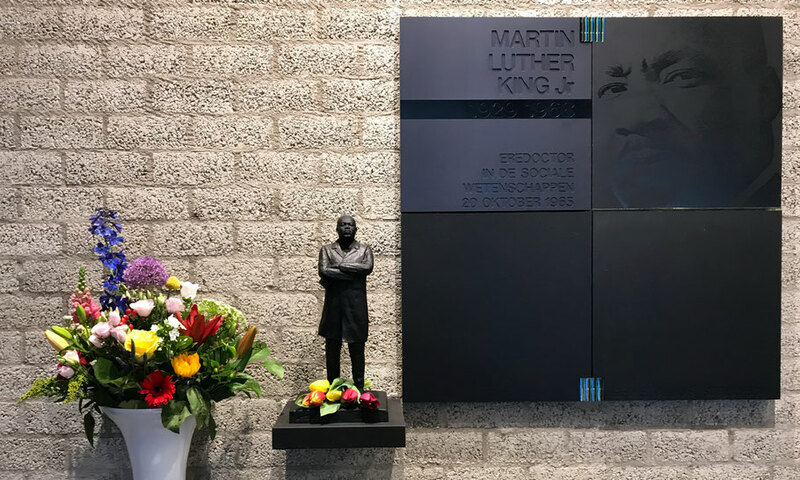 On October 20, 1965, Dr. Martin Luther King was awarded a honorary doctorate in Social Science at the VU (Vrije Universiteit, Free University) in Amsterdam, to celebrate the 17th lustrum. Queen Juliana, Prince Bernhard and Princes Beatrix were present at the ceremony in the Concertgebouw in Amsterdam. King received at least fifty honorary degrees from colleges and universities. In 1965, he was awarded the American Liberties Medallion for his "exceptional advancement of the principles of human liberty." In his acceptance remarks, King said, "Freedom is one thing. You have it all or you are not free." 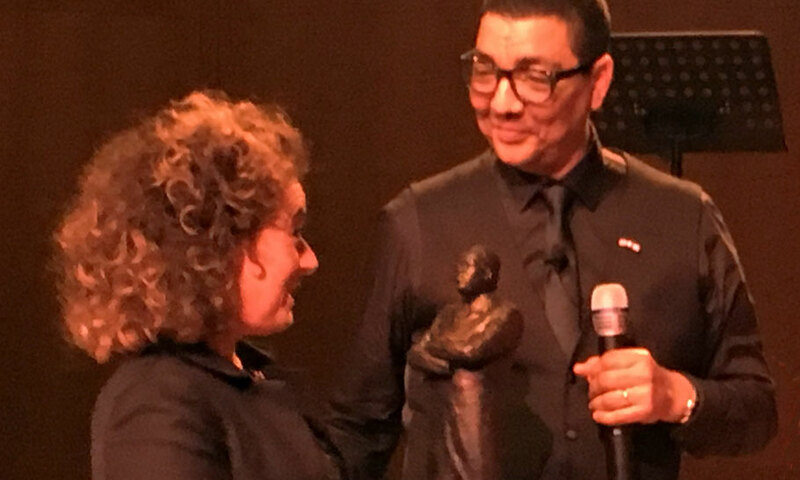 In 1966, the Planned Parenthood Federation of America awarded King the Margaret Sanger Award for "his courageous resistance to bigotry and his lifelong dedication to the advancement of social justice and human dignity." In November 1967 he made a 24-hour trip to the United Kingdom to receive an honorary degree from Newcastle University, being the first African-American to be so honored by Newcastle. In a moving impromptu acceptance speech, he said: "There are three urgent and indeed great problems that we face not only in the United States of America but all over the world today. That is the problem of racism, the problem of poverty and the problem of war." 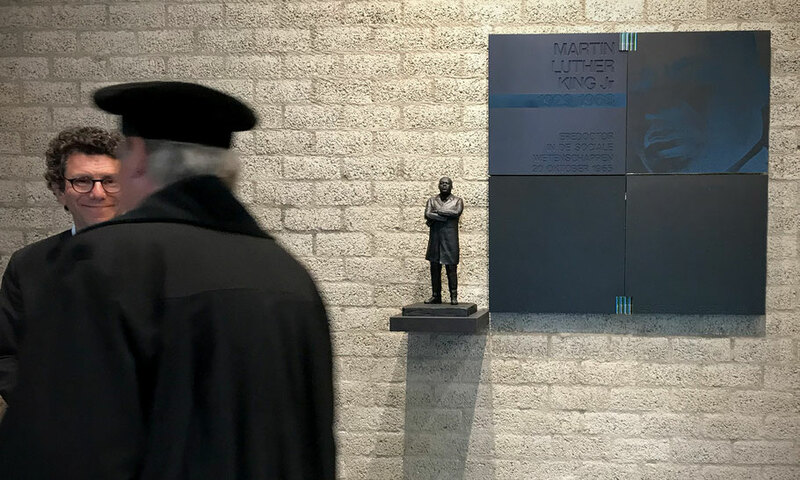 On September 4, 2018, at the opening of the academic year, the statue got a permanent place next to the memorial sign of Dr. King. Location: VU main building, Balcony 1, next to the Auditorium. De Boelelaan 1105, Amsterdam. Thanks to Liselotte Neervoort, Curator of Academic Heritage at VU University.